It seems like more and more often there are more and more games being brought to market through Kickstarter. Today I thought we’d take a quick peek at a few up-and-coming titles, and some that are giant successes already! The first is the quirky “Salmon Run” a modular board/deck builder that recreates the epic struggle of fish to make babies… Designed by Jesse Catron. Airborne in Your Pocket which only has a few hours left, is flirting with the $100,000 mark! That’s $70,000 OVER the funding goal! The game is a co-op tile=laying WWII action game. It looks fun, but a little pricey too. Heroes of Metro City – Another deck builder with a role-playing twist. Looks a bit like Dominion in spandex, with some fun superpower action tossed in. Get Bit! Deluxe Mayday Games is Kickstarting a new pirate themed version of their 2012 Origins award winner, with new graphics and dismemberment. And it comes in a nifty tin too! There are just a few short hours left in the Resistance: Avalon campaign. And don’t forget, Mars Needs Mechanics! Nevermore games is still in the middle of their campaign for their second title. We interviewed designer Ben Rosset, and Nevermore games’ co-founder Bryan Fischer, click their names to find out more about what’s going on at Nevermore games! And we watched Dice Hate Me Games’ Great Heartland Hauling Co. roll in hitting their last stretch goal with seconds to spare! Read our interview with designer Jason Kotarski here! So, what Kickstarter campaigns are you backing? Leave ’em in the comments! If you went to Gencon this year, there’s a good chance you heard the buzz about Chicken Caesar. Or you may have been lucky enough to sit in on a demo of Nevermore Games big box game of Roman/poultry politics. More than a tasty salad, Chicken Caesar is hitting hobby stores this month and the buzz has gamers waiting with baited breath to see what the excitement is all about. 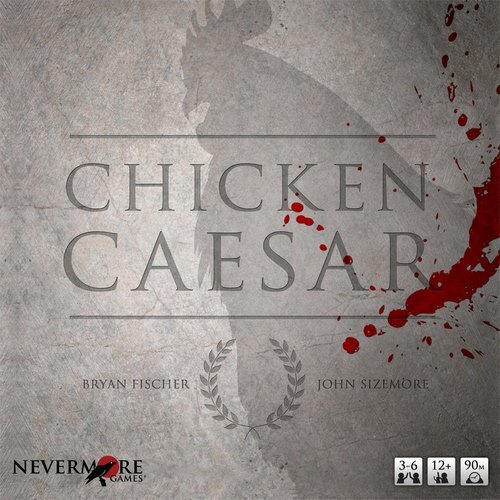 So we had a little chat with Bryan Fischer, co-designer of Chicken Caesar, and co-founder of Nevermore Games about Chicken Caesar, Nevermore Games, and life in general. Take us through the story of how Nevermore Games got on the map? My friend, Corey Phillips, and I started Nevermore back in 2010. He was the business guy and I was the creative guy. It wasn’t long though before I realized we really needed another creative guy, so we brought John Sizemore on board. I had been working on Chicken Caesar at the time and pitched it to John. We ran with it and started Nevermore’s mission: to facilitate friendships through strategic and innovative games. For those of us who didn’t make it out to Gencon, can you give us a quick overview of Chicken Caesar? Sure thing! In Chicken Caesar, players represent chicken families who are sending their roosters into coop politics, which of course are modeled after the Ancient Roman Government. Through deal making, breaking, bribes, and manipulation, players will compete for legacy. There are five offices in the game where roosters have actions they have to complete. The roosters in the Aedile’s office decide the tax rate for the round, which in turn determines how upset the coop guards are (and how many will betray the coop by letting the fox in to gobble up politicians). The roosters in the Praetor’s office decide where loyal and traitor guards go. The Censor can exile people, and the Consuls can take bribes to “rewrite history” and give roosters additional accolades they never earned in life. And of course there is Caesar, who gets the all-powerful Veto token and makes lots of corn (money). So which came first, the Chicken Caesar or Nevermore Games? Chicken or the egg, huh? Well, both. They happened simultaneously really. I had been designing games for years and about the same time that Corey and I started Nevermore, I was also toying with Chicken Caesar. Of course, Chicken Caesar didn’t really take the shape of its current form until John came on board. These puns are getting pretty fowl 😉 Actually, my wife came up with the name. She was eating a Chicken Caesar wrap, and I was of course annoying her with talk of game ideas I had and she said “Why don’t you call a game Chicken Caesar?” We both had a good laugh. Little did she know I was seriously storing that one away. What were the pros and cons (if there were any) to co-designing Chicken Caesar instead of going it alone? For me, co-designing is the ideal situation. I don’t think any game in history has been designed entirely by one person. Whether it’s through co-authorship or not, game designers have play testers and friends, critics and spouses who influence the design process and often come up with ideas for mechanics and theme. Having people to bounce ideas off of is a huge necessity in game design. John and I make a great design team. He’s a walking economics textbook and calculator rolled into one. It compliments my theme-centric approach to gaming and I believe that’s the greatest pro of co-designing games. Complimentary designers can take collaborative game design efforts to a new level. That being said, John and I argue a lot. That’s what happens when you spend so much time together trying to get something right. It can be stressful, but ultimately the arguing leads to better communication and therefore better game design. I guess that would be a con that turns into a pro. What’s the one element of Chicken Caesar that makes you all giddy? Well, mechanically it’s the Suffragium (the voting marker) that makes Chicken Caesar unique in its approach to luckless negotiation and shrewd bargaining. But really, for me, it’s that moment when a player about to be passed the Suffragium suddenly realizes… “I’m going to be deciding the fate of someone else’s rooster; I have the power, and I can be bought!” that gets me. Well into the testing of Chicken Caesar, players were discovering new ways to bribe each other and get epic revenge. Fantastic! How do you balance being a person of faith and a big geek? It’s funny how faith and being a geek interact sometimes. Some geeky endeavors, like science fiction, beg answers to questions of morality and truth. They present impossible and (often) unnatural circumstances where people have to make decisions often alien to us. It’s fascinating. Fantasy can often blur the lines for people of faith through use of magic and divination, but it’s not always the case. Look at Tolkien for instance. The Lord of the Rings trilogy is touted as a great Catholic work by many theologians. C.S. Lewis was much more overt. Read A Canticle for Leibowitz by Walter M. Miller, Jr. and you’ll see how faith can only make a science fiction experience even deeper. I find the best way to reconcile something that might be offensive to my faith is to first learn about it. If it’s a game, I’ll look at the rulebook or play it. If it’s a film, I’ll usually watch an excerpt or do some reading about the story. There have been times when, after researching something, I have still found it offensive. And the opposite has also been true. What has been most surprising to you about the response to Chicken Caesar from the gaming community? The fact that people know of the game! It’s been incredible. At GenCon we had the game set up in a number of places and people walked by and said “Oh yeah, it’s that Chicken Caesar game!” On top of that we met a ton of our Kickstarter backers there and sold out every demo event for the game through Saturday. John and I walked over to the Asmodee booth one morning and while chatting with a French guy working the booth, he says “Wait, you two are the Chicken Caesar guys?! Very cool!” So cool. So, we’ve been following the Mars Needs Mechanics Kickstarter; beyond that, what’s in the future for Nevermore Games? We actually have quite a few things lined up for the future. We’re working with some really awesome designers to bring the world an awesome, big game next Spring. 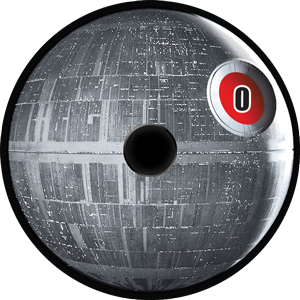 We have some others in the lineup for after that, so expect plenty of games in 2013 from Nevermore. 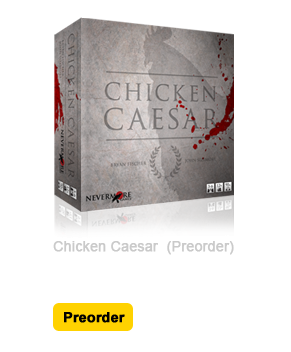 If you’d like to place your pre-order for Chicken Caesar you can do so RIGHT HERE! You can also find out more about Nevermore Games RIGHT HERE! And of course they’re on Facebook and Twitter as well! A big thanks to Bryan for spending some time with us, and as always a big thanks to you for reading! It’s hard to believe we’ve been at this for over 2 months now! We are so grateful for your support and interest in what we do here! As always, we would love to hear your feedback on what takes place here at Theology of Games! Here’s what we were up to this week! We took a look at the Kickstarter campaign from Nevermore Games for their newest title “Mars Needs Mechanics”. In other Kickstarter news, The Great Heartland Hauling Co. closed out its funding drive for its upcoming release with Dice Hate Me Games this week, with a successful campaign! Jeremiah reviewed the Matt Worden Games dice-rolling, car-racing party game, “Dicey Curves”. Fantasy Flight Games gave a whole lot of details about their new Star Wars Living Card Game. And Firestone reviewed the newest title from Small Box Games: Tooth & Nail: Factions! Again, thanks for reading, and keep the feedback coming! Mars Needs Mechanics Hits Kickstarter! Well if you joined us earlier this week for our interview with game designer Ben Rosset. You know that today is the day that the newest title from Nevermore Games – Mars Needs Mechanics – hits Kickstarter. You can check out and back the campaign RIGHT HERE! While you’re there you can see a few different videos about the game including some gameplay demos. You can see the full interview with Ben Rosset here. They’re up and running and off to a good start, best of luck guys! Thanks for reading and have a great holiday weekend everyone!